Have you heard of Pick Your Plum yet? This site is seriously addicting, each day they post a new deal, and you have to get it before it’s gone! 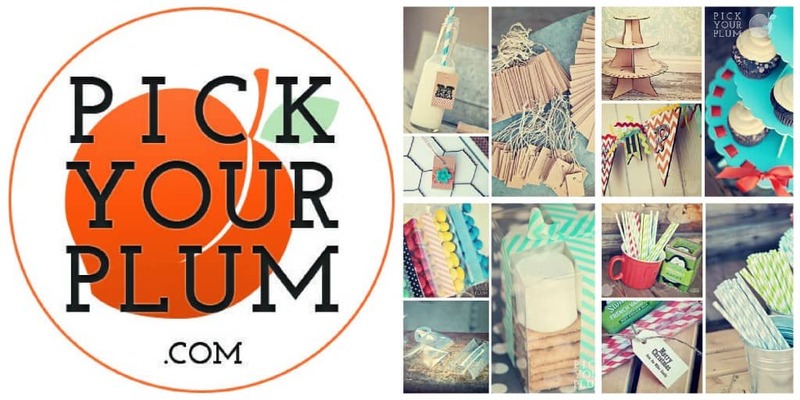 Pick your Plum is my number one source for straws, bakers twine, cupcake liners, washi tape and so much more! And as the winner of this prize, you will get a “Plum” box filled with $50 worth of assorted goodies! 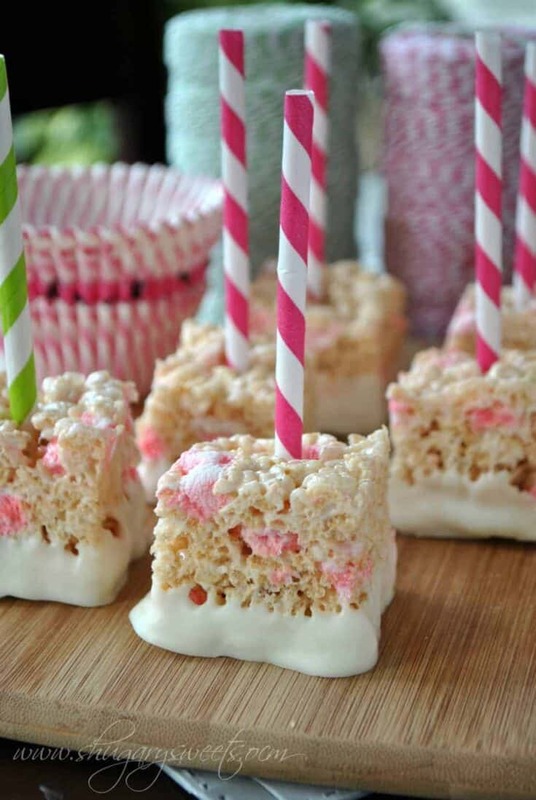 But I’m making myself feel better….with Rice Krispie Treats. But now that I’m all grown up and such (kinda), I like to make fancy treats and have perfected how to make rice krispie treats. Ha! 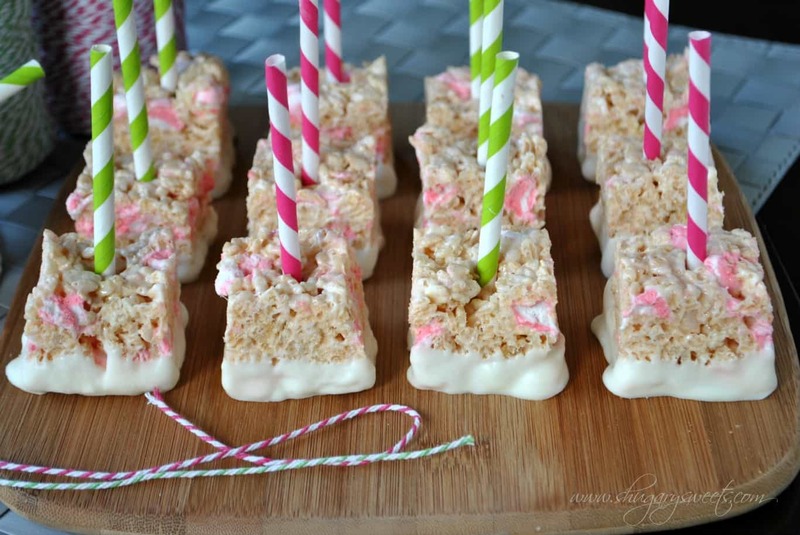 Fancy Rice Krispie treats? Oxymoron! In large pot, melt butter over medium heat. Add in bag of regular mini marshmallows, reduce heat to low. Stirring constantly, melt marshmallows completely. Remove from heat. 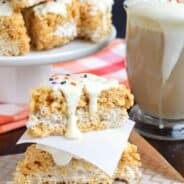 Fold in pudding mix and Rice Krispies cereal. Carefully fold in peppermint marshmallows. Press into a parchment paper lined 9inch square baking dish. Allow to set, about 1-2 hours. Cut into small squares, pressing a straw (I cut my straws in half) into top of treat. Dip bottoms of each square into melted white chocolate. Set onto a piece of parchment paper and allow to set (about 15 minutes). ENJOY! 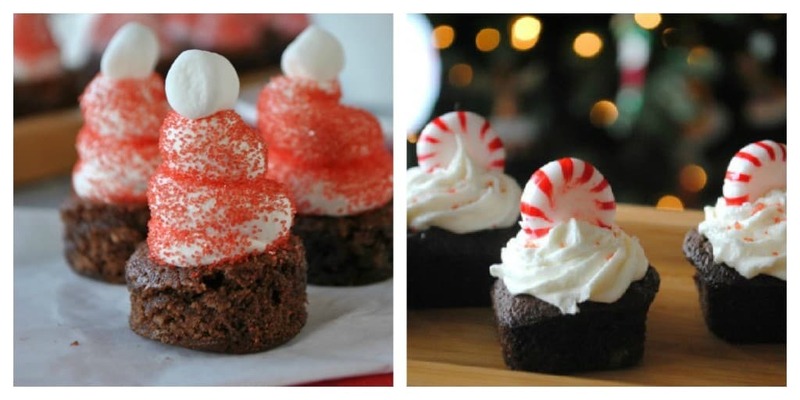 What is one of your favorite treats to make for the holidays? 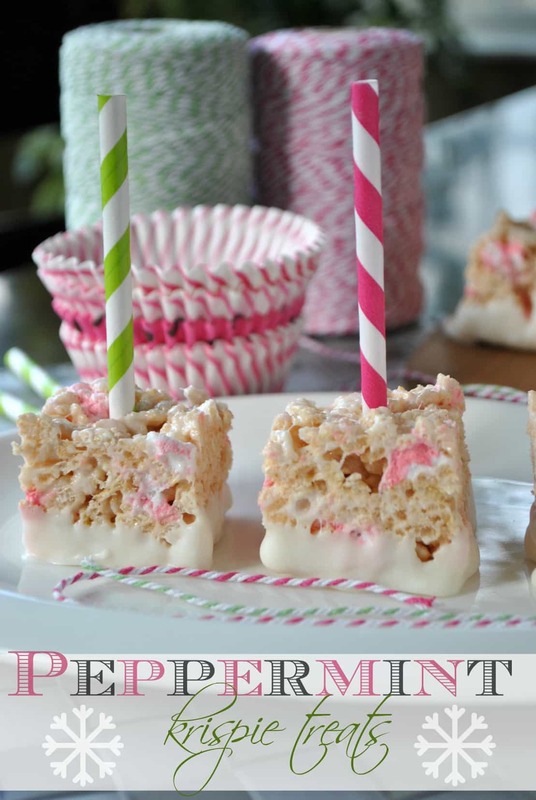 As you are aware I love Rice Krispies….and pudding gives a fun twist to any treat! 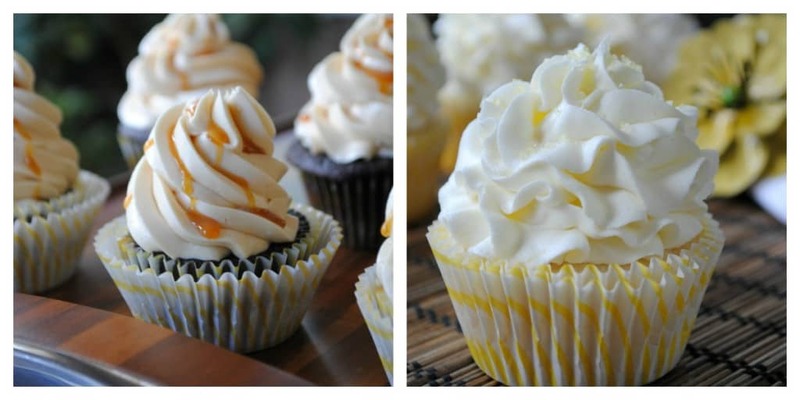 Cupcakes are an easy dessert that can feed a large group too! Brownies make an appearance every year at our holidays. Especially bite sized brownies! Don’t miss a single post! 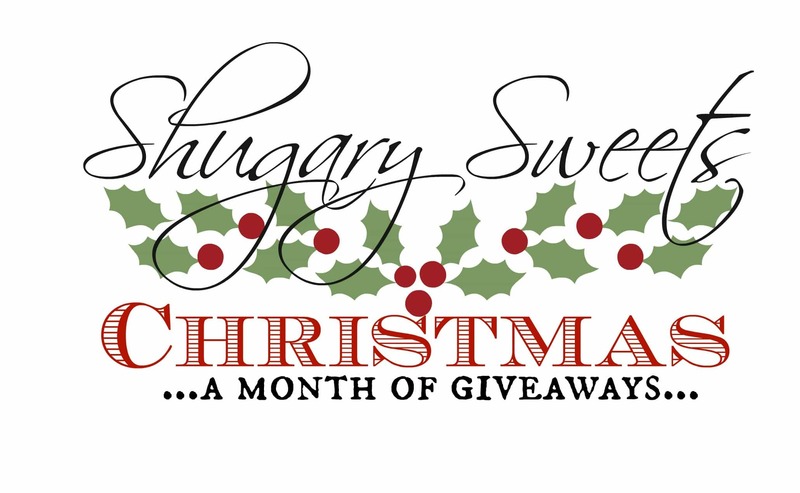 Be sure to follow Shugary Sweets on Bloglovin! I love cute cupcake liners – Id like to see some of those! I love PYP cupcake liners! So many fun colors! I hope some are in the package if you win! I would like the cupcake liners! Oops…I don’t know why my update posted to Karen’s post…sorry about that Karen. Way to be innovative!!!! Good tip for others, thanks for sharing, and the feedback! 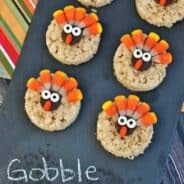 These look delish Aimee! I’m going to try whipping up a batch tonight. Thanks Dawna, let me know what you think!!! Easy wins big points in my book…and fancy? Who knew! Being a food blogger, I adore their cupcake liners and pretty straws! I would love to have anything in a basket to help with food styling!!! All of their stuff is soooo cute! I’m hoping for some twine but anything from PYP would be awesome! I just love their site & if I didn’t have any self-control, I’d be broke beyond belief!! Thanks for the giveaway! I have zero self control when it comes to PYP. I’ve ordered 5 times in the past two weeks. Help me. I hope I get washi tape, or anything to help with my baking for the holidays! I would like anything that either is used for baking or in the gift wrapping of food gifts. Pick Your Plum looks like my heaven and I have no idea how I haven’t heard of it yet!! Warning: PYP is highly addictive. Hard to stop the cuteness!!! Paper straws and their twine! Just something about a pretty string tied around cute food! Cupcake liners and paper straws!! I did see the legging….totally adorbs! My girls are all too big, and I have one neice (she is 17) and 7 nephews. hehe!! I loooove me some Krispy treats! I also enjoy eating half of the pan, hehe 🙂 this peppermint version looks super yum. And I want some new paper straws. I love them so! You have got some awesome looking goodies! SO glad I ran across your blog! I want everything Pick your plum has so I am sure I would love anything that is in the box!!! How did I not know about Candy Cane Jell-o Pudding Mix???? Definitely going to be on my shopping list 🙂 Pinning for sure! 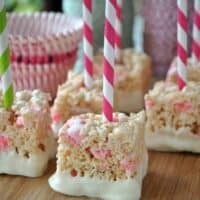 I’d love for you to share this at my linky party Aimee – http://www.momontimeout.com/2012/11/your-creative-timeout-party-no-58/ I’d love to see some of those cute paper straws and some Christmas baking supplies! I would love some cute liners! I would soo love some beautiful twine or cute stripy straws in my bag!! 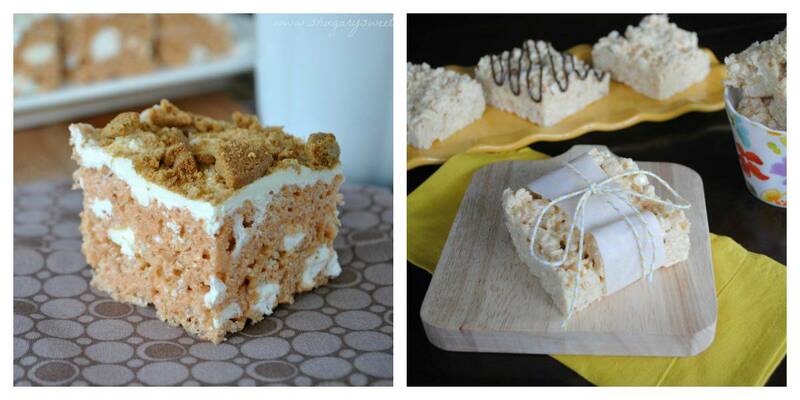 I made your recipe for Pumpkin Pie Spice Rice Krispie Treats and they were yummy. I had never heard of Pumpkin Pie Spice Pudding before reading that blog post. I ran right down to my local Walmart and there it was. Thanks for all the inspiration. Glad you found it and enjoyed them!!! the stick and cupcake liners!!!!!!!! Cupcake liners or treat bags and washi tape would be great. I love PYP! Washi tape or cupcake liners! How fun! I sure hope the box is full of cute baking supplies like straws, twine, and paper bags!!! Love all the PYP stuff!!! Anything is fine- pick your plum has such cool stuff! But they sometimes have really neat gift tags that I would smile to see! I love Hello Dolly Cookies in my box! I love making mint chocolate chip cookies over the holidays, it’s usually so hard to find good mint chips the rest of the year so I tend to horde them once they show up in stores again. Crazy right? Can’t wait to see what you come up with!!! I want some of those paper straws! I’d say straws, but I just bought some because i neeeeeeed them. So….leg warmers. I know, weird. But I see them on their all the time and want them, but can’t justify buying them. 🙂 LOVE the krispie treats too! I love all their stuff, but I really want some twine! 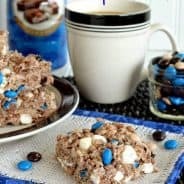 I have a rice Krispy treat addiction as well!! I’m always trying to come up with diff ideas to make them gourmet! ;)… I did some kinda like your gingerbread ones with gingerbread flav marshmallows and gingerbread Oreos with little dollops of frosting through out. It was delish! I’m hoping for the adorable straws and tags. I have not been able to find those Gingerbread Oreos! I’m sure that was delicious!! I want those straws!!! So cute! I love Pick Your Plum! Cupcake papers, washi tape and just about anything else would be great! I’d really like to have those rice Krispy treats in my box! My second choice would be to have the Washi Tape. Cupcake liners would be awesome! I like those paper straws too! I love making soda cracker candy. People are always amazed that it has crackers in it. Would love to get some twine and cupcake liners and, well, just about anything would be great! I hope some washi tape or cupcake liners are in the box. I would love cupcake liners and baking twine! But whatever is in the box I will love! I’ve got to get on the washi tape band wagon! I want some paper straws and cupcake liners. Love PYP! Oh my goodness I love Pick Your Plum and have been ordering so many accessories for my holiday baking. I would be elated to win this prize! Nope, I was worried too, but they slid right in!!! I’d love to get unique cupcake liners for every occasion. I would love twine, goodie bags, and goodie boxes! Love Pick Your Plum…just bought some straws but could always use more!! love baking cookies and my eggnog pound cake! I would love to get my bakers twine! I’d love the straws and twine, but would be excited with just about anything baking!! I have never heard of the site but now I think I’m totally addicted. Love the cupcake liners and paper straws. 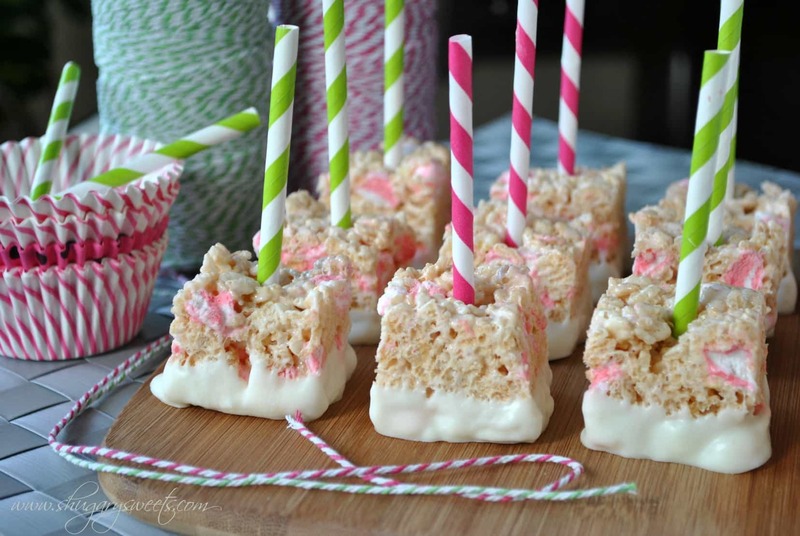 Peppermint Rice Crispies…I think I am in love. What a wonderful treat. I have been looking and looking for that pudding and have yet to find it. Now I have reason to start stalking the managers until I get some!!! Cupcake liners and bakers twine! I love Pick Your Plum and have ordered a couple of times from them. I would love anything of theirs, maybe some rick rack trimmings? Sometimes I am too late and the deal is gone, but their deals are awesome! Really hoping for lots of super cute baking stuff, like cupcake wrappers, bakers twine, and other cool stuff. I hope for some cute cupcake liners. I’ve never seen the decorative twines they show in the video at Pick Your Plum. I’d love to have some of that in my kitchen. I not familiar with Pick Your Plum but cupcake liners are always great. Thank you for the giveaway and the opportunity to participate. I would love to receive some twine! I would love washi tape and twine! So much to look at..love the cupcake liners too! Beautiful products for the holiday baking. I would like some paper straws. I am a sucker for colorful paper straws. I will have to keep an eye out for when those are on PYP. I love how you you used them for your treats. I would love the cupcake towers or any cute item for my baby girl. I just love everything PYP! I hope there is a jewelry kit or anything. I love to craft. I would love the lollypop straws for my students. Any kind of baking supplies would be awesome! I would love the staws!! I think my daughter would like to make these little krispie treats.and make them like a lollipop! I could love a whole bunch of stuff! I am hoping for a little of everything lol. No I am always happy with whatever I get but recipes and ideas are always welcome! Thank you so much for a chance to win. I love the cupcake liners – always need more of those! Baking Goodies or sewing items! I’d be in heaven if there was $50 worth of cupcake liners in mine…I just love those dainty little papers! I’d love bakers twine in a variety of colors. Bakers Twine! I just can’t get enough! I like making maple-bourbon monkey bread! I’d love a little bit of all of the Pick Your Plum baking supplies. They are one of my “guilty pleasures”….sssshh, don’t tell the hubs! Oh I hear ya! Don’t tell my hubs either! I love the cupcake liners! I would love love love some fun paper straws, washi tape, and crafty items in my box! I would love cute cupcake liners! oops, I missed out 😉 anyway, good to “meet” you! I have looked everywhere for peppermint jello and marshmallows…where did you find them? Hi Chris, I have found them at Walmart, Kroger and Meijer. I’ve heard KMart sells the JELL-O pudding too!!! Good luck, I hope you find them!!! I am happy to hear that the JELL-O pudding is available at those stores because I looked on the JELL-O web site and it is not listed. I’m going to look for it. I couldn’t find the Candy Cane pudding or Peppermint marshmallows. So I used Cheesecake pudding and crushed candy canes. It could of used a little peppermint extract for more of a peppermint flavor, but they were very good. And for future this is a great ‘base’ recipe to work with so many other flavor options. Thanks Aimee!! Ok, seriously. How did I not know about Candy Cane pudding?! Where has it been all life?